Temporary Restraining Order or TRO was finally issued by the Supreme court yesterday, October 9, 2012. The effect of the TRO will be for a period of 120 days. Thus, the effect of this TRO will block the implementation and/or enforcement of the Republic Act No. 10175 (Cybercrime Prevention Act of 2012) or also known as the Cybercrime Law for those period of days given. It was said in a report that the sudden issuance of the TRO is due to a pile of complaints filed mostly by organizations, bloggers, and private individuals and so with series of rallies outside the streets that binds together to show their protest against the said law. In a news report written by PhilStar, it says, "Fifteen petitions have been filed before the Supreme Court questioning the constitutionality of the new cyber law, which President Benigno Aquino III signed last September 12." Posted below is the full text of the TRO issued by the Supreme Court. 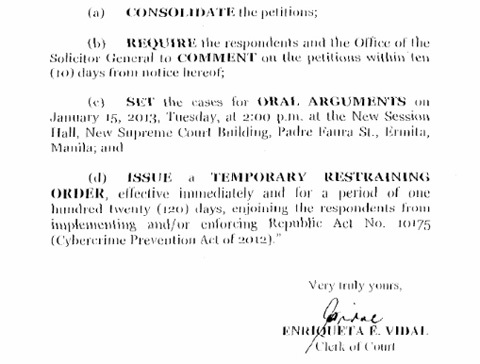 Oral arguments regarding the petitions against the Cybercrime law is set this coming January 15, 2013, Tuesday, at around 2:00 of the afternoon. It will be held at the New Session Hall, New Supreme Court Building, Padre Faura St., Ermita in Manila. Comments or suggestions about "Supreme Court finally issued a TRO against Cybercrime Law" is important to us, you may share it by using the comment box below.